This BLUEDEF Diesel Exhaust Fluid 2.5 Gal is made to meet the specific demands of diesel engines. It's designed to support a cleaner environment by emitting fewer airborne fumes into the atmosphere, making it an ideal option for your vehicle. 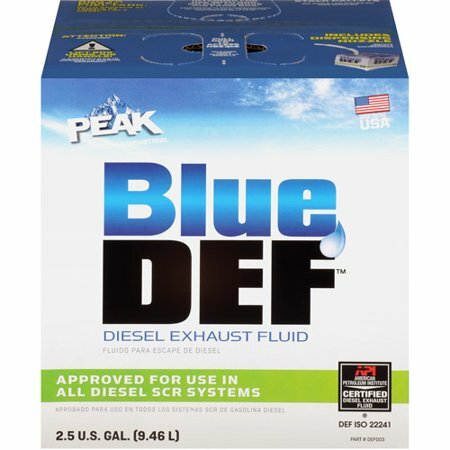 This peak bluedef diesel exhaust fluid works to ensure the optimum performance of SCR engines, offering you performance that you can rely on. Use it to promote better fuel mileage in your tractor, truck or another type of vehicle that calls for it. The bottle is conveniently sized, which makes it easy to pour, transport and use. This peak blue def 2.5 gals can easily be stored in your garage or workspace until you need to use it. It's simple to pour, so you can have your vehicle ready right away. It's approved for use in all diesel SCR systems. The BLUEDEF Diesel Exhaust Fluid 2.5 Gal will make a convenient and helpful addition to your vehicle care system, keeping your tractor running smoothly for a long time. Ingredients: 67.5% Water (7732-18-5), 32.5% Urea (57-13-6). Instructions: Do not add to diesel fuel tank. This product intended for use with box. Do not remove jug from box. Do not double stack pallets. Attention: Lift box using jug handle! Blue DEF should only be added to the dedicated Diesel Exhaust Fluid tank. Do not add to the diesel fuel tank. BlueDEF is ready-to-use. Store between 12 degrees F (-11 degrees C) and 86 degrees F (30 degrees C). When I first ordered this DEF, description said that the minimum order for the product were 2 x 2.5 gals. But the price was so reasonable that I went ahead and ordered it. My 2019 Ford F250 diesel's DEF was at half tank. I used one of the 2.5 gal container to fill the tank. I still have another container left. Love it. An essential product for diesel engines and costly at the dealership. Reasonably priced at your neighborhood Walmart. Comes with a filling nozzle and is easy to fill without spilling a drop! The only problem may be the weight of the 2.5 gallon container if you are on the puny side. I have used Blue DEF for years, and it works really well. Perhaps one drawback is that it has a poor venting system for pouring, but I just punch a couple holes in the top away from the spout with an awl. What every Newer Diesel truck requires! Almost fills the tank with one box! The online ordering was easy to do. The pricing was the best around! It beat Automotive stores and dealers by a mile! Thanks. Will shop online again! What is this? Is it an additive for oil or fuel?? 1. No, this is a special fluid that is only for diesel engines that require diesel exhaust fluid (DEF). The DEF is used for a process whereby the diesel particulates (dark diesel exhaust) is collected in a special unit; and then periodically burnt up using DEF. For engines requiring DEF, there is a special port marked for DEF refilling only. These diesel vehicles normally have a special gauge which tells whether there is enough DEF. These vehicles also give warning messages when the DEF is low. 2. new diesel engines have a separate, smaller tank for this urea fluid. The engine mixed it automatically to clean the exhaust. 3. It is a plastic bottle with the pouring nozzle included. Easy to use. 4. DEF stands for Diesel Exhaust Fluid. This fluid is needed by the newer diesel engines. 5. Someone previously advised that the engine "mixes" this to clean the exhaust. This is not correct. Diesel exhaust fluid is sprayed by a ninth injector (V8 engines) into the SCR (Selective Catalytic Reduction) system. It's a means of converting nitrogen oxides, also referred to as NOx with the aid of a catalyst into diatomic nitrogen, N2, and water, H2O. A gaseous reducing agent, typically anhydrous ammonia, aqueous ammonia or urea, is added to a stream of flue or exhaust gas and is absorbed onto a catalyst. Carbon dioxide, CO2 is a reaction product when urea is used as the reducing agent. Selective catalytic reduction of NOx using ammonia as the reducing agent was patented in the United States by the Englehard Corporation in 1957. Development of SCR technology continued in Japan and the US in the early 1960s with research focusing on less expensive and more durable catalyst agents. The first large scale SCR was installed by the IHI Corporation in 1978. How often does the DEF need to be added? 1. 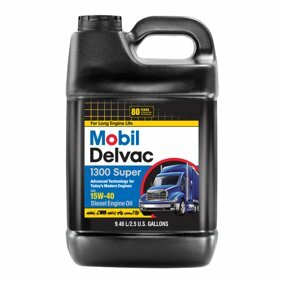 For my 2013 GMC diesel, I have found that it needs about one gallon of DEF per 1,000 miles. Would this work on a 2009 BMW 335Diesel? 1. This should be compatible with any DEF system. I use it with Mercedes, Ford and Dodge systems.